McClain quarterback David Jett jukes a Unioto defender on Friday at McClain High School where the Tigers took on the Shermans in high school football action. 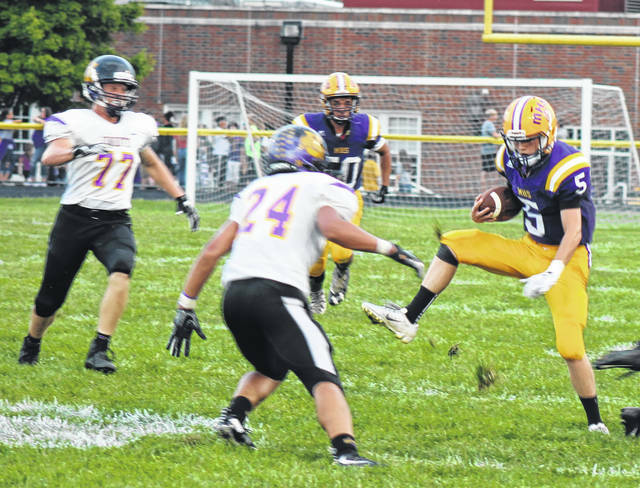 The McClain Tigers took to their home field for the first time in 2018 and dropped a non-conference showdown to a talented Unioto Shermans squad. The Shermans received the opening kick and moved the ball successfully on the ground, marching the ball down the field to the red zone. The Tigers defense dug in and sacked the Shermans quarterback to bring up fourth and long. The Shermans rolled the dice and decided to go for it on fourth down. The call turned out to be a good one as the Shermans quarterback completed a 13-yard pass for the conversion. On the next play, running back Jarmacus Carrol ran the ball across the goal line to give the Shermans an early 7-0 lead. On a rare call for a pass by the Tigers, the Shermans intercepted quarterback David Jett’s pass to give the Shermans outstanding field position on the Tigers 12-yard line. On the next play, Carrol again found pay dirt on a 12-yard run to extend the lead to 14-0 in favor of the Shermans. The Tigers needed a spark to keep the game within reach and received one on an 88-yard kick return for a score by Pat Fout. The Shermans blocked the PAT attempt to maintain an eight-point lead with the score 14-6. After an interception by Colton Mossbarger, the Tigers were in prime position to pull closer in the ball game but turned the ball over themselves via fumble. After the fumble, the Shermans took over at the Tigers 15-yard line. Again, Carrol found a seam in the Tigers defense for a 15-yard touchdown run. The Shermans missed the extra-point but still were in control of the game by a score of 20-6. Turnovers again plagued the Tigers on their next possession. The Shermans intercepted another errant pass and raced toward the endzone. Tigers tight end Dalton Mischal chased down the runner and forced a fumble, but the Shermans recovered the ball and ran it across the goal line to give them a commanding 27-6 lead just before the half. The second half wasn’t nearly as entertaining as the first. The only score of the second half came on a three-yard touchdown run by Shermans running back Jamarcus Carrol – giving him his fourth touchdown of the game. The Tigers moved the ball on the ground nicely in the 4th quarter but couldn’t quite find the end zone. When the clock ticked down to nothing but zero’s, the Shermans came out on top by a final score of 34-6. The Tigers again look to bounce back next Friday when they host Zane Trace. Game time is set for 7 p.m.
Spencer Michael is a stringer for The Times-Gazette.